Have you ever wanted to enjoy a progressive dinner at the Walt Disney World® Resort? Now’s your chance! 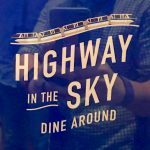 The Highway in the Sky Dine Around is a new offering that provides guests unique experiences at three different Walt Disney World Resort hotels. Traveling between the resorts is a breeze, thanks to a monorail car dedicated to the participants of this exciting event. I had the opportunity to enjoy this experience last week, and look forward to enjoying it again in the future! The dining experience begins in the lounge of The Wave… Of American Flavors at Disney’s Contemporary Resort. After checking in, we were presented with our first drink of the evening, a Bay Lake Sunset, one of my favorite signature cocktails! Since the experience is limited to about 20 guests per night, you have plenty of time to meet and chat with the others in your travel group. 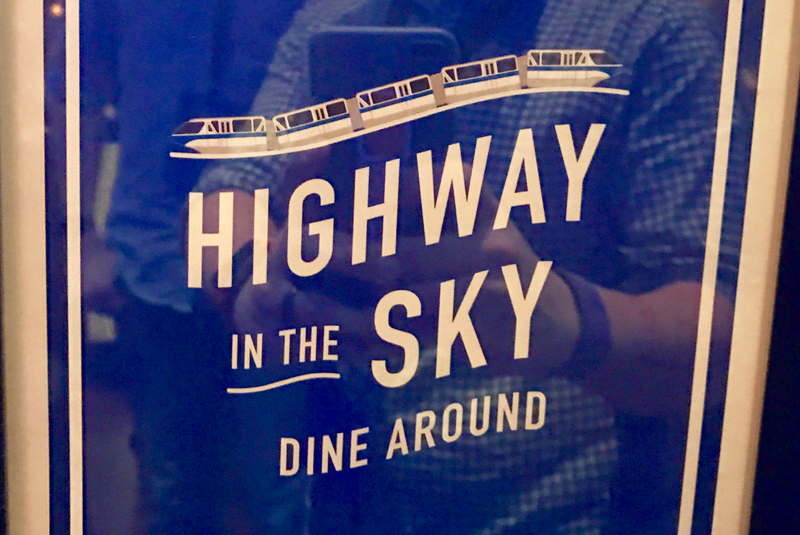 The Highway in the Sky Dine Around begins in the lounge of The Wave… Of American Flavors at Disney’s Contemporary Resort. After enjoying our cocktails, the Chef Kimi came out to greet the group and explain our first course – a butternut squash soup. Chef explained the process of making the soup, and described why it may taste a bit different from other butternut squash soups we’ve had in the past. It was certainly some of the best soup that I’ve ever had! Our group was escorted by three Disney cast members who traveled with us to each resort. They were truly fantastic and provided a great experience to everyone! After finishing up our soups, the cast members escorted us upstairs to the monorail platform, where we boarded a reserved car in the train. After boarding the monorail, it was on to our next stop: Trader Sam’s Tiki Terrace at Disney’s Polynesian Village Resort. It was beginning to drizzle during our visit, so we were all provided with ponchos before we headed outside to our covered area. High top tables were waiting for us, complete with Trader Sam’s signature HippopotoMai-Tai! After taking a moment to enjoy our drinks, two small plates were delivered to each table. 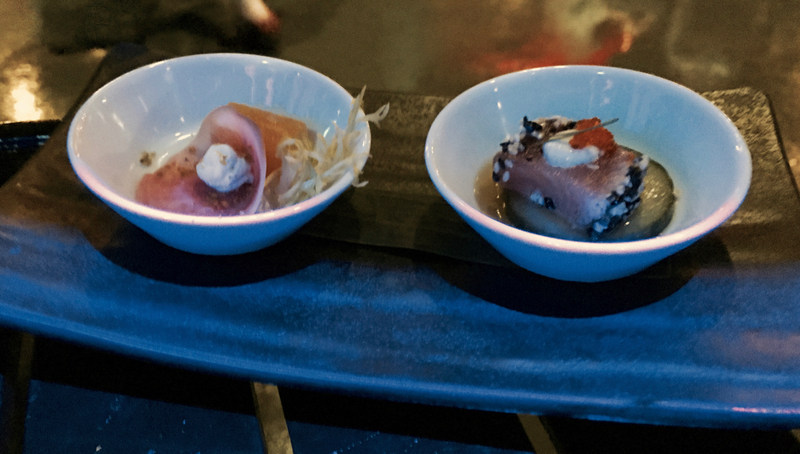 We did not get a chance to speak with a chef about these dishes, but they were very yummy! One was a seared sesame-crusted tuna, and the other was a small marinated beet salad. As we were finishing up our food, the cast members came around to tell everyone that we would be leaving in about five minutes. The stop at Trader Sam’s Tiki Terrace at Disney’s Polynesian Village Resort included sesame crusted tuna and marinated beet salad. After boarding our dedicated monorail car, we departed for Disney’s Grand Floridian Resort & Spa, where we got to enjoy our next course at Citricos. 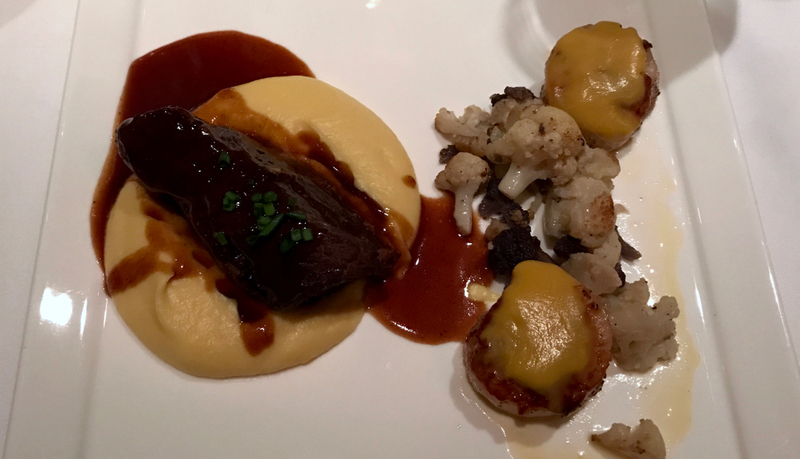 We were paired up with other members of our group and assigned tables for our main course – braised beef short rib and seared scallops with mashed potatoes and seasonal vegetables. The entree was paired with a glass of red or white wine. This meal was truly worthy of Citricos long-standing tradition of serving some of the best food at the Walt Disney World Resort. As we finished our meals, the cast members came around to tell us that the Electrical Water Pageant would be beginning soon. As we left Citricos, we were handed a glass of champagne to enjoy while watching the show! We moved to one of the balconies off of the second floor of the Grand Floridian and got a great view of the pageant! We enjoyed braised beef short rib and seared scallops with mashed potatoes and seasonal vegetables at Citricos at Disney’s Grand Floridian Resort & Spa. Our final trip on the monorail whisked us back to where we started – Disney’s Contemporary Resort. Here we proceeded to the 5th floor patio for dessert, cheese, cordials, and a great view of the Wishes Nighttime Spectacular. 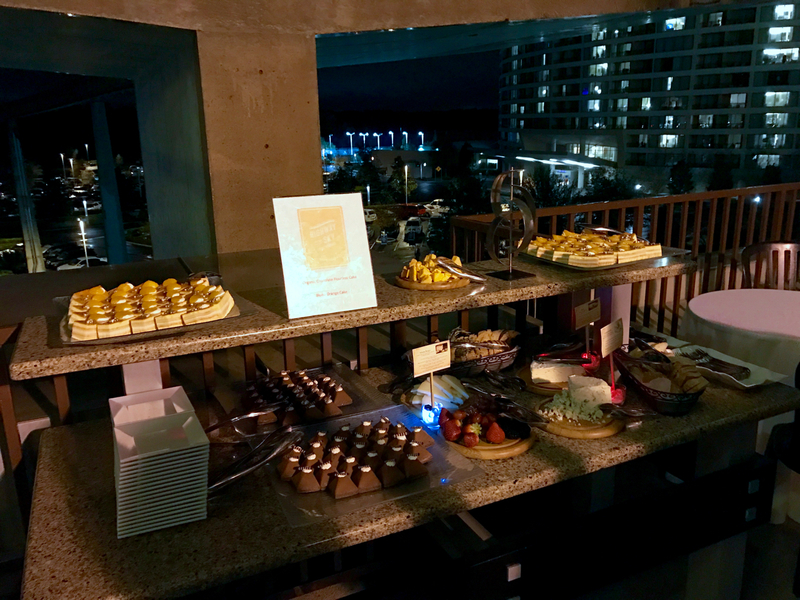 We enjoyed dessert, cheese and cordials on the 5th floor patio at Disney’s Contemporary Resort. Overall, this was a really great, unique experience. 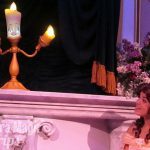 The cast members both at the restaurants and traveling with us were absolutely phenomenal. 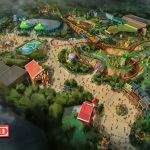 Having an opportunity to chat and mingle with the other guests partaking in the Highway in the Sky Dine Around with us gave us a chance to make connections that we never would have made. 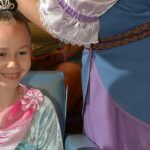 There are many activities and experiences across the Walt Disney World Resort that are great for adults. This is a must-do if you are looking for that exclusive event that isn’t cramped with people from wall-to-wall. 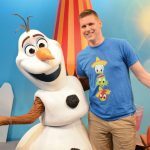 As a Disney vacation planner, it is important for me to take advantage of new experiences at the Walt Disney World Resort. 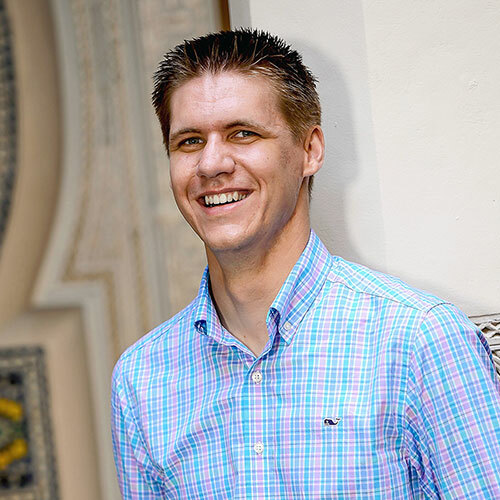 These experiences empower me to be able to make personal recommendations that my guests will love. If you’re ready to plan your vacation, please contact Extra Magic Trips today to get started!